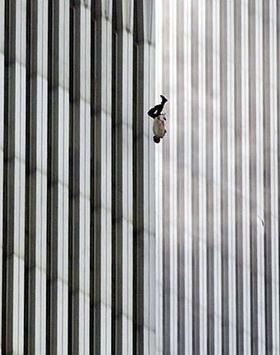 The Falling Man is a photograph taken by Associated Press photographer Richard Drew of a man falling from the North Tower of the World Trade Center at 9:41:15 a.m. during the September 11 attacks in New York City. The subject of the image, whose identity remains uncertain, was one of the people trapped on the upper floors of the skyscraper who either fell searching for safety or jumped to escape the fire and smoke. At least 200 people are believed to have fallen or jumped to their deaths that day while other estimates say the number is half of that or less.